Hunger is always around us if we look beyond our own table. There is always something we can all do, Give. The Tybro Foundation in coordination with the Open Door Ministries in High Point, NC will be sponsoring a week of three meals a day on July 10 – 16, 2016. On Saturday, July 16th the officers of The Tybro Foundation and volunteers will be serving Lunch at the Open Door Ministries facility in High Point, North Carolina. The Open Door Ministries was established in 1995, as a merger of High Point Urban Ministry and Open Door Shelter. High Point Urban Ministry was begun in 1969 and provided assistance for food, clothing, and financial needs. Urban Ministry also operated a soup kitchen that served a lunch meal (Monday – Friday). Open Door Shelter started in 1987 and provided a homeless shelter for men, women and children. The Father’s Table program at Open Door Ministries serves three meals a day seven days a week to the homeless and less fortunate in the community. There are no stipulations as to who is served as they truly offer an “open door” to those who are hungry. In 2004, Open Door Ministries began a “Million Meal” campaign and in 2011 the goal of serving one million meals was surpassed. Over 12,000 meals per month are donated, prepared, and served by local churches, organizations, businesses, restaurants and community volunteers. The program makes it possible for those in need to receive a hot meal at no cost. The program serves men, women and children of all ages. The Tybro Foundation is honored to serve and provide meals to such a worthy cause. Every dollar that is given is used in service of others. The more we receive the more we can help. Thank you for your assistance. 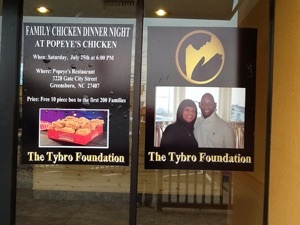 In July 2015, only one month after being incorporated, The Tybro Foundation hosted a chicken dinner at Popeye's Restaurant for the first 200 families. It was an incredible success and many people were able to eat that day. In November 2015, The Tybro Foundation hosted a Turkey Giveaway to the first 200 families to help with Thanksgiving needs. 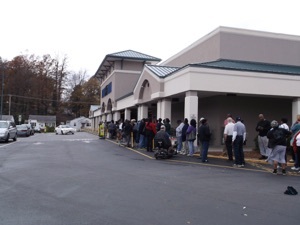 The lines were around the corner and the people were very grateful for the 20 lb turkeys they received. In July 2016, The Tybro Foundation in cooperation with The Father's Table of the Open Door Ministries provided 3 meals a day for a week and finished with a Lunch Buffet. The officers and volunteers of the foundation served the food to all those who came to the luncheon.